Wonderful park more yhan 4 ha large, cited between the mosy beautiful gardens of France, it has been left to the town by its generous benefactor Pierre Hyacinthe Dumaine, at the same time as the building housing today the Town Hall. As soon as you enter, in front of the bust of its donor, a sumptuous yews avenue, dated from 1830, cut like pyramids, leads you to the open-air theatre. Just a step away from here, a clearing, brightened with lawns and flowers beds up, open up. 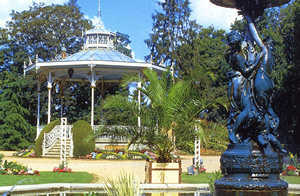 In the middle, an octogonal ornamental lake with bronze made naiads and a bandstand have been built and unveiled on 1907. In a green depression, relic of old quarries, hides a little lake, its cave and rockeries. Then, there is the wood, with tall trunks treated on the English manner. A least, bordering Saint François Avenue, a large lawn decorated with topiaries depicting the La Fontaine Tales, is completed with a small orangery since 1875. Since this year, a viewpoint diagram and a signalling allow to discover the numerous tree species that line the garden avenues. Every year, from decades, on July, the garden is set ablaze by 3500 lanterns lighted at nightfall, and a concert livens the bandstand up. Thousands of Luçon inhabitants and tourists meet for this traditional night fest. You would also discover the Fuschia species "Richelieu", "Ville de Luçon" and "Jardin du Maine" which honor several clumps of our garden. To all that, can be added the talent of the nteam of local gardeners who, as well as maintaining the Park, where many tree species mix (Magniolia, Tulip Tree, Purple Beech...) make the town more beautiful : cutting trees in architectural forms since 1950, decorating streets and round-about with flowers.